Community of Practice – What’s it All About? One of the biggest questions arising out of Art of Hosting trainings and related work I’ve been part of these days is, what’s next? How do we actually practice and sustain what we have just learned? How do we grow our skill, courage and capacity as practitioners? How do we create fertile conditions in our organizations or our communities to shift the shape of our future, the way we work and even the work we do? In March 2011, I co-hosted the Art of Collaborative Leadership in Nova Scotia with good friend and colleague, Jerry Nagel from the Meadowlark Institute in Minnesota. He shared a model he and Chris Corrigan have been using in Minnesota as a means of thinking about and being in a Community of Practice (CoP). 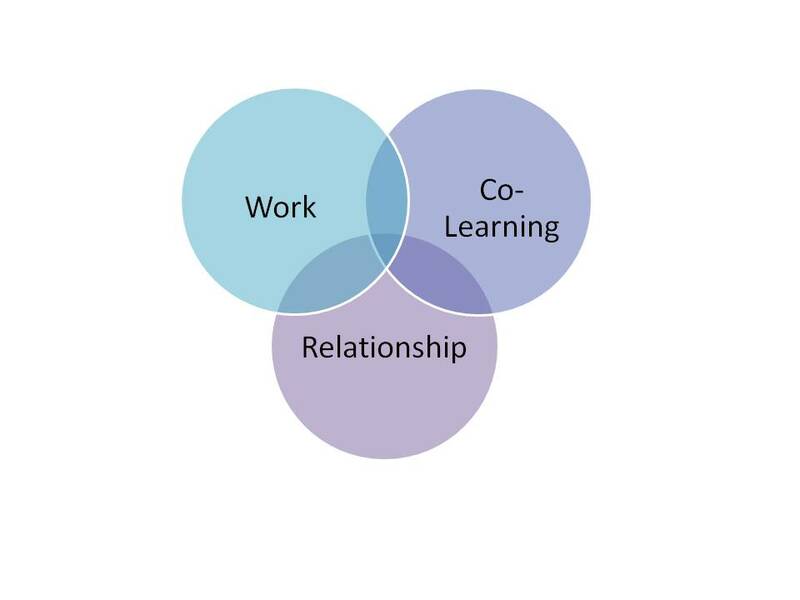 I refer to it often now as it reminds me and the groups I work with of key elements that contribute to learning, growth and shifting the way we work and are with each other. Work alone can be drudgery. Learning alone can be a great intellectual pursuit and might lead to some shift within you as an individual but does little to generate collective learning. Building good relationships is a good skill to have but in and of itself, you might as well be in a social club. It is where and how work, learning and relationship intersect that creates the potential for a rich and relevant community of practice. 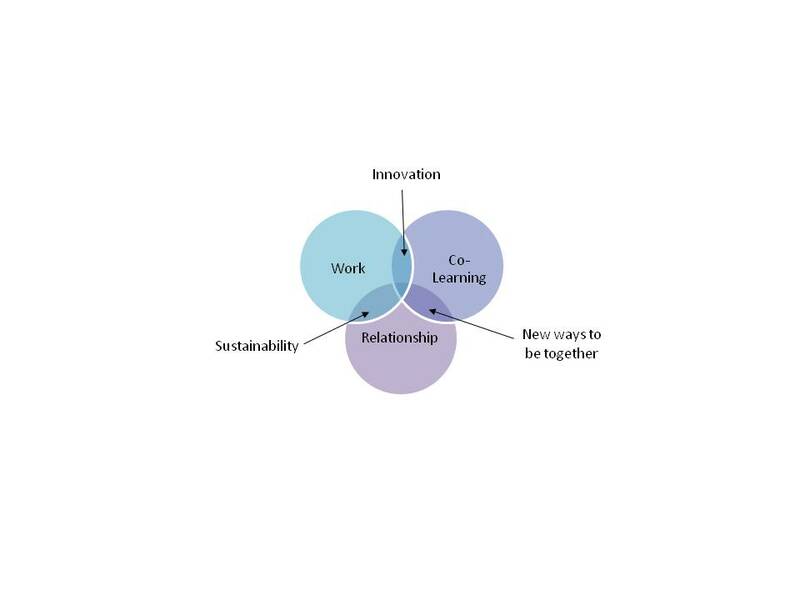 The intersection of work and co-learning is where innovation happens as people think about the context of their collective or co-learning in relation to work. Ideas are generated and possibilities emerge. Without relationship though, there is often no traction or sustainability to the innovative ideas that emerge – they simply dissipate into thin air because there is no impetus to work with them on an ongoing basis. 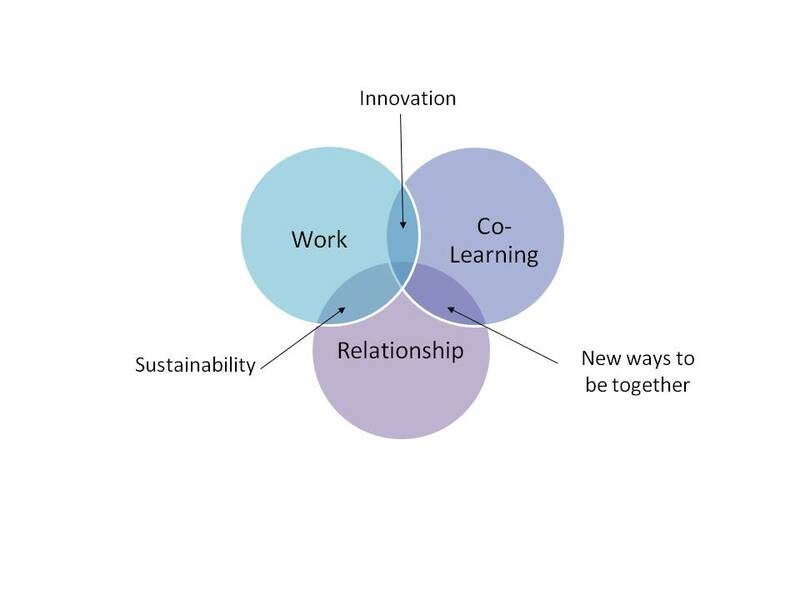 It is at the intersection of work and relationship that sustainability happens. And not just any relationship will do. The relationship needs to be of good quality, filled with respect, trust and deep caring for each other – the quality of field that enables divergent points of view to be expressed, where passion for the conversation, the work, the future and friends is welcomed. Friendships we will fight for and support. We don’t necessarily start there but how beautiful when we tend to the relational field with such care and intentionality that so much more can spark without risk of offending anyone, without having to tiptoe around the conversations that are most necessary in our learning, relationship and work. These are friends with whom we will venture into unexpected places, uncertainty, emergent fields and creative explorations as well as nurture and cultivate the innovations that most spark our passion and curioisty. When these people call us because they need something, we respond. Sometimes we drop everything else and respond. Powerful friendship, kinship or mates is fostered in the place between relationship and co-learning because part of what we are learning is how to be together in new ways that break old patterns that have defined relationships, at work, home or in other places where we make contributions and commitments – patterns like hierarchy and culture, old ways of moving work along,old ways of meeting and of thinking about meeting agendas, conferences or programming. One of the key reasons we want to shift our relationships, aside from the experience of feeling better, working more effectively and enjoying showing up at work and projects is to focus them on achieving something meaningful and relevant in the world – maybe systemic change, maybe some smaller initiative. Otherwise, nothing happens. We are at such a pivotal time in our human evolution on this planet, a Community of Practice will be most meaningful when we bring our relationships and collective learning to bear on the shift we are wanting to create rather than putting up with the shift that just shows up. Having now been in several conversations about community of practice, most recently with emerging leaders in Halifax – none of whom are following conventional career paths, this model becomes extremely helpful in focusing on the purpose of a community of practice, especially as conversations tend to veer to one component or the other. The power in the model is that it reminds us that each of these elements is fundamentally important to shifting patterns of work, organizations and communities, as well as individual patterns of relationship. Communities of Practice could and will be many things – defined by the people who gather in them. There is some core that attracts people into them – it could be creating an active practice ground in a community or organization for new skills, a safe haven in an environment that seems resistant to new work and new ways of working, an opportunity to grow individual and collective capacity. The ones I’ve been part of seem to have an energy and magnetic attraction of their own that keep people showing up, an ease of flow and relationship, shared leadership and shared responsibility. Nobody has to make them happen, they almost seem to make themselves happen. They are fun. People who show up really want to see each other, be with each other and dive into deep places within themselves and with each other. There is some intentionality applied and the CoP is able to follow the path of emergence that points to what needs and wants to happen next to be most meaningful to work, relationships and learning. Many of these CoPs don’t just know that something different is possible, they are beginning to demand it and showing up together, cultivating deep relationships and imagining what is possible that none of us individually might have imagined on our own while growing skills to support what we are envisioning is one way of creating movement, maybe even creating a movement. This entry was posted in Art of Hosting, Community, Leadership and tagged Art of Hosting, Chris Corrigan, community of practice, CoP, Jerry Nagel, Kathy Jourdain, Shape Shift Strategies Inc. by Kathy Jourdain. Bookmark the permalink. Thanks for sharing this Kathy! And Chris and Jerry thank you for sending this along the path of relationship you share with Kathy…. Thank you Maurice – and Ho! to the power and path of deep, meaningful relationships by which concepts are shared and grow. Grateful every day. I invite conversation around the interesting ways our local communities of practice are showing up in an environment that is increasingly interested in one of two things: either co-opting the affective potentials and directing them into ‘feel good’ contentment with an institution that making ‘good citizen/subject/workers’ just as fast as it can; or busying those of use who might be interested in systematic systemic change in practices whose reach diminishes rapidly and the machine continues moving along lubricating its gears with the squishy suffering of those it sacrifices. A long-time fascination (and something that grows through my AofH practice with mates) is how the structures of this machine (things like classrooms, committees, boards, etc.) can be turned to doing what they never were intended to do. Rather than producing citizen/subject/worker/buyers who feel they have answers, the classroom produces fluid/dynamic/wicked question askers. Instead of operating on fear and constrained by the burden of representing constituencies according to how one was ‘appointed’ to committees, ‘committees’ can be self-organizing and peopled by individuals who seek only to represent themselves in the best way possible in the moment… etc. any thoughts reflections ideas will cause bows of gratitude! Hi kathy- thanks for this it is so helpful and such a lovely simple yet meaningful model and I really resonate with your thoughts about the quality of relationship a true community of practice both calls into being and calls out. Im part of the most wonderful community of practice in the UK – Hara Practice Collaborative and we are learning so much about working, living, learning, being together with the wider field of the finance lab, tasting the future. This is such a timely post, as just yesterday we were talking about hosting our first intentional CoP meeting with a smaller group of people from tasting the future, shifting the focus of our meetings from task/work focus to relationship focus – or more rightly intentionally brining relationship into relationship with the work. We were thinking about how to frame this in, this model is great. Also Im working, along with another field, with the EU commission and CoP is high on the agenda there. Would be great to have a conversation some time, maybe with others to share learnings – maybe through the CoP group in the AoH ning. Would you be interested in that? Thank you for this Kathy, like Linda said it couldn’t have come at a more appropriate time. Nice Kathy. This is a model I use often also, particularly around essential aspects of conversational leadership. A bit more to help perhaps with this good learning about CoPs. Thank you for this great orientation to a CoP model. I’ve been working with an Innovation CoP in the Ontario Public Service for the last year and we’ve been fumbling along looking for an organic sustainable model that doesn’t copy the hierarchical structure of our organization. I think we stumbled onto this model without knowing it when we organized a local TEDx event this spring. We based our role structure on a Theatre company, but at it’s heart we had the right combination of Work, Co-learning and Relationship. I think CoPs of this model, working within more orthodox organizational cultures, like Provincial Public Services, can have an important “cultural trojan horse” effect of showing a possible alternatives. Thanks for sharing your learnings. Such a rich exchange here friends. There is so much I want to respond to, reflect on and possibly add here over the next few days thoughtfulness that comes from sitting with this a bit – perhaps over the next 48 hours, half of which will be spent driving from NS to Quebec and back again – a little lighter in load on the return trip as I leave a few things at Bishops University. You are very welcome Sergio. Thanks for finding my writing. Thank you, Kathy and all, it is so important, that we learn to work in a “long body” of innovation and learning, that is what Communities of Practice provide. And cultivating them truly is an art form and takes some “gardening” care, both for the support of the creation and for the maintenance. That is often overlooked..The Bregenzer Salon also offers a platform for those communities to emerge and grow. It is amazing what can emerge when the right containers of trust, learning and relationship are offered. And all the same in large organisations! To me one of the main things are, as said above, to not to want to “make” anything happen, but to stay centred in one’s middle, so we can support the New come through the way it wants to. Wishing all of us good success in cultivating! Kathy, I have copied this great article over on the AoH Ning site! Next will be Tenneson’s material. Thanks for sharing this model and , too, your personal perspective. This is my comment . According to the theory that a system is more than its components, you explain that “more” . This is my way to see the conditions for that “next step” (that I would qualify as “outreach”the momentum” of the venue) . For an indivdual to commit himself to be in the next step, it comes down to being/remaning the partner of/in : a) the common clear purpose (=i.e. the clearity of his willing twards it), b) the seeing, feeling, sensing of the number of people engaging in one way or another for this common purpose (the clearity of being in the common, so not being alone ), c) the expectation that the path to this purpose is somehow within reach (the clearity of his hope), d) the next step is in a “reasonable” time span (the clearity of his time-setting), d) the continuous adjustement everyone makes by himself in his way and by his means to stay in tune with these “ingredients” ( the clearity of his tuning).